Mike Ullery | Daily Call Piqua High School sophomores Isaac Abbott, Isaiah Mears, and Isaiah Vinson check out the new Wall of Honor in the lobby of PHS. The interactive display pays tribute to alumni who have served or are currently enlisted in the Armed Forces. 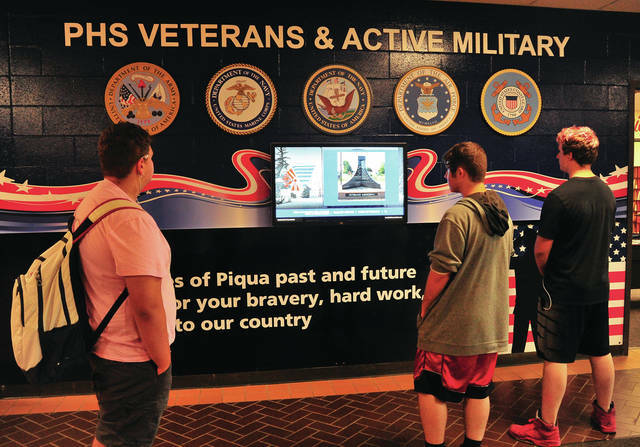 PIQUA — Patriotism meets technology at Piqua High School, where a new interactive touchscreen database honors alumni who are military veterans, as well as those currently enlisted in the Armed Forces. Recently installed in the school’s lobby outside the administrative offices, the Wall of Honor is one of the first things visitors to the school will see upon entering the building. The display grew out of talks about improvements that needed to be made at PHS, according to Principal Rob Messick. He added that the Wall of Honor — which showcases service members from 1944 to the present — plays well into the district’s participation in the Ohio Department of Education’s Success Bound strategy, which presents the military “as a viable career,” Messick noted. With the seed of an idea planted, Messick was challenged with how to make the idea bear fruit. He found the answer during a visit to Bangor, Maine, where his son is in the Coast Guard. Funds poured in from private donors, service organizations like the American Legion and VFW posts, PHS graduating classes, among others — totaling approximately $18,000 to finance the project, which, in addition to the touchscreen designed by TouchPros, features a three-dimensional background by Quint Creative Signs with stars and stripes, and three soldiers in silhouette. To register online, visit piqua.org and click “Select A School.” After choosing “Piqua High School,” select “Veterans Wall Registration” from the list on the left side of the page, and fill out the form. Information includes name, year of graduation, branch of service, rank and a brief description of military services/accomplishments. Additionally, up to three photos of a military nature can be submitted. Families of deceased soldiers are welcome to submit their loved ones’ information, Messick said. In addition, there will be an open house from 8 a.m. to 2 p.m. on Veterans Day for those who wish to register. https://www.dailycall.com/wp-content/uploads/sites/30/2018/10/web1_100418mju_phs_veteranswall.jpgMike Ullery | Daily Call Piqua High School sophomores Isaac Abbott, Isaiah Mears, and Isaiah Vinson check out the new Wall of Honor in the lobby of PHS. The interactive display pays tribute to alumni who have served or are currently enlisted in the Armed Forces.